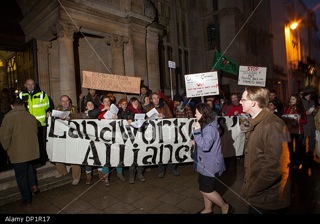 I’ve just returned from the Oxford Real Farming Conference, organised in opposition to the Oxford Farming Conference. The two days in the company of passionate people actively working to produce a practical sustainable food system was as ever inspiring and heartening. One of the major developments in the area of sustainable agriculture over the last couple of years is the emergence of the Landworkers’ Alliance (http://landworkersalliance.org.uk/) representing small-scale producers in England, Wales and NI (Scotland’s small producers have the Scottish Crofting Federation http://www.crofting.org/). As a small scale orchard grower, I’m proud to be a member of the LWA and helped to draw up their constitution. The LWA is also a member itself of the global campaign Via Campesina (http://viacampesina.org/en/) campaigning for food sovereignty and the rights of the peasant farmers who feed 70% of the world. “About 70 of us set off from the Oxford Real Farming conference at 7:30 AM to politely protest outside the doors of the OFC and talk to delegates about how we felt our voices were being excluded from the debate about farming. The point of the protest was that the price of a ticket is £345, which most of us felt was too expensive to make the conference accessible to farmers who have lower incomes. The average income for farmers last year was £12,000. The conference sets itself up to simulate debate about the future of farming and dominates the discourse about farming that takes place on a political level and in the mainstream media. The conference and it’s main sponsors Syngenta, Volac and Burges Salmon, published a study as the foundation of the discourse for the conference called “opportunity agriculture”. The study outlined what the farmers they interviewed felt was the future of farming in the UK by the year 2024. The OFC organisers gave copies of the report to many of us outside the conference which we had a good look at in the pouring rain! It seemed clear by the text of the study that the message was that farmers interviewed felt that they would need to “get big, ‘get modern’, or get out”. The primary “opportunities” for future farmers outlined were increasing efficiency by moving towards macro agriculture ie mega farms employing robotic milkers or large arable adopting transgenic technology, contract farming or share farming for retailers – basically- work for the big boys- you’ll never be able to make it on your own…. Owner occupied farms would be phased out- there was no mention of small independent farms, family farms, community supported agriculture, organic farming, direct marketing- NONE AT ALL! Sure they had a few small farmers in the room, but it was for a massive brainwashing session. What we wanted to bring forward is the view that this is not an inevitable path for the future of farming. Many of us do not accept that we only have a future if we work for agribusiness and adopt biotech. We want government policies to support a future that includes small farms, family farms, agro-ecology and direct sales to local people. I got the feeling that many of the delegates going into the conference felt the same way, but felt powerless to move against this tide. I feel that we were successful in getting our message across to many of the delegates and the organisers. Many delegates were sympathetic and even agreed with what we said- especially our point that the conversation about farming is dominated by agri -tech strategies. The conference organisers have agreed to allow the LWA to possibly speak in a session next year and at least send some delegates at a reduced price. If some of us get in there we can start to question this inevitable dystopian future of farming they have presented us with. Three cheers for Gill Barron and Simon Fairlie who managed to get into the conference and asked questions of both Peter Kendall (NFU) tax avoidance by larger farmers claiming subsidies., and Owen Patterson, questioning his support for GM and mega dairies. They managed to get in 2 of the 6 questions from the floor. It is a start. We are starting break into the agri-establishment and make our voice heard! So, carrying on from here, The Landworkers’ Alliance is compiling a position paper looking at DEFRA policy through a food sovereignty framework, making the case for smallholder agriculture, family farms and agro-ecological farming and putting forth specific policy suggestions to support landworkers. Send specific suggestions for what you need to support your livelihood on the land from government policy. There is a team of us compiling the position paper and we want it to reflect your experiences and needs. When you got set up o the land what barriers did you face that could be solved through better policy- what support were you lacking or still are? The Landworkers’ Alliance would like to see enough people on the land to provide for the majority of the food we need to eat in the UK. All of us now are doing this in the face of a pretty unhelpful system- to understate the case a little. What can the government do to support our movement in making this happen! Anyone interested in getting involved in making this strategy- we need your help. Once this report is together and we have all had a chance to look at it and make sure it is making the case we all want to make, we would like to organise a strategy session to get our suggestions into policy. We are planning a parliamentary launch around April through the All Party Parliamentary Group on Agro-ecology. We then plan to approach all of the political parties so that they can incorporate our suggestions into their rural manifesto- in the hopes that the next agricultural minister appointed won’t be as dire as Owen Patterson. We will need to call on everyone to get in touch with their MP’s and local policy makers.